Right in front Gare du Nord with many means of transportation, going to Orly, Roissy, Disneyland Paris, Parc des Expositions Villepinte and to the centre of the capital. We have recently installed air conditioning in all the rooms and the common areas. Normally stay in hostels, but as a couple this time the private room prices nearby where nearly triple the price as here. Great little hotel, directly opposite the Euro star, easy to get around with the metro below and we walked a bit as well, nice enough area with food etc around. From the reviews I was expecting it to be really basic, but was lovely little hotel. 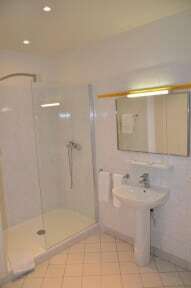 Nothing fancy, but we had quite a modern bathroom, clean and tidy. Perfect for us just wanting someone to sleep at night. Hotel Richmond was an excellent spot to stay overnight before our train out of Paris the next morning. It is directly across the street from the station, we were able to check in late, the beds were comfortable and the room/bathroom was clean and nicely updated. Really the only downside was that there was a lot of noise from the street on a Saturday night. Would definitely stay there again for the convenient access to Gare du Nord. Nice Hotel. Had a balcony looking out at Gar de Norde. I enjoyed my stay. Well located with access to metro, international trains and hop on/hop off buses. Plenty of restaurants and shopping options close by. I only stayed one night. I didn’t ask about a common area but it seemed more like a hotel than a hostel. Breakfast was in the cellar of a sister hotel next door. Front desk was very helpful. Bathroom had some stains on the wall that might have been blood but overall the room was so clean and the furnishings very nice. I’d stay again. I had a private room which I prefer. Great location close to the metro, room clean, bathroom less clean, restaurants and grocery store were close by and easily accessible. Great staff, very helpful with directions and travel planning! Did not actual stay at Hotel Richmond but instead was moved to New Hotel which was around the corner. Parking was very tight but was in secure garage. Linens were clean and staff was great. Was our first time in Paris so not sure what to expect. The shower was without a curtain so we did not take good showers because were concerned about flooding the bathroom floor! There were also molds on the shower walls and dirty floor due to water on the floor! One night, there was no bottle water for purchase because it was sold out! There were human noise across the street at nights, from the Gare du Nord! One good thing about this hotel is that it's across from the Gare du Nord but I wouldn't stay at this hotel again! I'm sorry!